This Furla hobo bag is crafted from texture-rich leather. Magnetic top. Leather-lined, 2-pocket interior. Sling strap and optional, adjustable shoulder strap. Dust bag included. 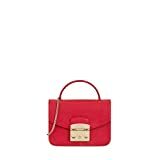 A petite Furla cross-body bag in rich, pebbled leather. A polished push lock fastens the top flap. Faille-lined, 1-pocket interior. Hideaway chain shoulder strap. Dust bag included. 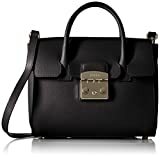 A petite Furla satchel in rich pebbled leather. 2 side pockets. Raw-edged flaps trim the sides. The magnetic top flap opens to an unlined, 1-pocket interior. Adjustable shoulder strap. Dust bag included. A boxy Furla tote in saffiano leather. Polished logo lettering accents the small front pocket. Magnetic top. Faille-lined interior with 1 pocket and a middle zip compartment. Rolled handles and optional, adjustable shoulder strap. Dust bag included. Add exceptional color and personality to your ensemble when you carry the Furla™ Candy Meringa Mini Crossbody! Made of irresistibly colorful PVC. Fold-over flap with push-lock hardware for closure engraved with brand name logo. A pebbled-leather Furla mini bag is all a girl needs when she only needs the essentials. You can grab it and go as a clutch or release the chain strap to wear it cross-body-either way, your look will be stylish and classic. A petite Furla cross-body bag in rich leather. A polished push lock fastens the top flap. Faille-lined, 1-pocket interior. Hideaway chain shoulder strap. Dust bag included. Roomy enough for your candy and your cookies (or your keys, cards, and phone), this colorful structured rubber bag by Furla is pure fun. 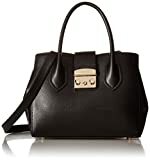 A pebbled-leather Furla mini tote is what a girl wants for all her essentials. Luxurious leather and ample inside pockets combine for form and function-so you’ll be stylish and organized through your busy week. Express a dynamic new outlook with the charming Furla™ Peggy Medium Tote! Handbag made from genuine 100% leather. Spacious top opening with brand logo engraved push-lock for closure. Spacious leather lined interior features multiple slide pockets for easy storage. A signature style, this Furla Metropolis mini bag is the perfect essentials-only bag. Carry it by the top handle or use the chain strap to wear it as a polished crossbody. Step out in refinement with the Furla™ Pin Medium Tote East/West Handbag. Handbag made of 100% genuine grainy leather. Flat base with metal feet provides upright structure. Spacious interior lining features centered zipper compartment, dual back-wall zipper pockets, and front-wall dual slide pockets for desired storage of all of your essentials. Details: – Adjustable shoulder strap. – Zip top closure. – Exterior features 1 back zip pocket. – Interior features 1 zip wall pocket and 1 slip pocket. – Dust bag included. – Approx. 10″ H x 12″ W x 2.5″ D. – Approx. 21-22″ strap drop. – Made in Italy. Materials: Leather exterior, textile lining. 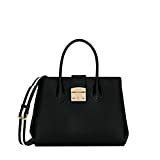 Find more Furla handbags products on Amazon!